Consumer cooperatives are enterprises owned by consumers and managed democratically which aim at fulfilling the needs and aspirations of their members. They operate within the market system, independently of the state, as a form of mutual aid, oriented toward service rather than pecuniary profit. Consumers' cooperatives often take the form of retail outlets owned and operated by their consumers, such as food co-ops. However, there are many types of consumers' cooperatives, operating in areas such as health care, insurance, housing, utilities and personal finance (including credit unions). In some countries, consumers' cooperatives are known as cooperative retail societies or retail co-ops, though they should not be confused with retailers' cooperatives, whose members are retailers rather than consumers. Consumers' cooperatives may, in turn, form cooperative federations. These may come in the form of cooperative wholesale societies, through which consumers' cooperatives collectively purchase goods at wholesale prices and, in some cases, own factories. Alternatively, they may be members of cooperative unions. Consumer cooperation has been a focus of study in the field of cooperative economics. One of the world's largest consumer co-operative federations operates in the UK as The Co-operative (commonly referred to as "The Co-op"), which together operate over 5500 branches of 'The Co-operative' branded business including The Co-operative Food (The UK's fifth largest supermarket chain), The Co-operative Funeralcare, The Co-operative Travel, Co-operative Legal Services, Co-operative Electrical, The Co-operative Bank and The Co-operative Energy. The Co-operative Group is by far the largest of these businesses, itself having over 4500 outlets and operating the collective buying group. 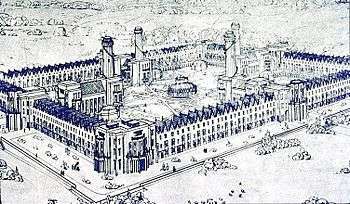 Consumer cooperatives rose to prominence during the industrial revolution as part of the labour movement. As employment moved to industrial areas and job sectors declined, workers began organizing and controlling businesses for themselves. Workers cooperative were originally sparked by "critical reaction to industrial capitalism and the excesses of the industrial revolution." The formation of some workers cooperatives were designed to "cope with the evils of unbridled capitalism and the insecurities of wage labor". Consumer cooperatives utilize the cooperative principle of democratic member control, or one member/one vote. 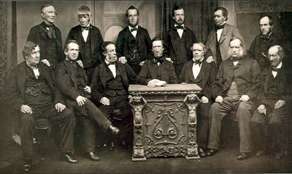 Most consumer cooperatives have a board of directors elected by and from the membership. The board is usually responsible for hiring management and ensuring that the cooperative meets its goals, both financial and otherwise. Democratic functions, such as petitioning or recall of board members, may be codified in the bylaws or organizing document of the cooperative. Most consumer cooperatives hold regular membership meetings (often once a year). As mutually owned businesses, each member of a society has a shareholding equal to the sum they paid in when they joined. Large consumers' co-ops are run much like any other business and require workers, managers, clerks, products, and customers to keep the doors open and the business running. In smaller businesses the consumer/owners are often workers as well. Consumers' cooperatives can differ greatly in start up and also in how the co-op is run but to be true to the consumers' cooperative form of business the enterprise should follow the Rochdale Principles. The customers or consumers of the goods and/or services the cooperative provides are often also the individuals who have provided the capital required to launch or purchase that enterprise. The major difference between consumers' cooperatives and other forms of business is that the purpose of a consumers' cooperative association is to provide quality goods and services at the lowest cost to the consumer/owners rather than to sell goods and services at the highest price above cost that the consumer is willing to pay. In practice consumers' cooperatives price goods and services at competitive market rates. While some claim that surplus payment returns to consumer/owner patrons should be taxed the same as dividends paid to corporate stock holders, others argue that consumer cooperatives do not return a profit by traditional definition, and similar tax standards do not apply. Since consumer cooperatives are run democratically, they are subject to the same problems typical of democratic government. Such difficulties can be mitigated by frequently providing member/owners with reliable educational materials regarding current business conditions. In addition, because a consumer cooperative is owned by the users of a good or service as opposed to the producers of that good or service, the same sorts of labor issues may arise between the workers and the cooperative as would appear in any other company. This is one critique of consumer cooperatives in favor of worker cooperatives. Many advocates of the formation of consumer cooperatives – from a variety of political perspectives – have seen them as integral to the achievement of wider social goals. "That as soon as practicable, this society shall proceed to arrange the powers of production, distribution, education, and government, or in other words to establish a selfsupporting home-colony of united interests, or assist other societies in establishing such colonies." Cooperative Federalists, a term coined in the writings of Beatrice Webb, were advocates for the formation of federations of consumer cooperatives as means of achieving social reform. They anticipated such a development as bringing a broad set of benefits including economic democracy and justice, transparency, greater product purity, and financial benefits for consumers. The Neo-Capitalist economic doctrine seeks to transfer the provision of almost all government provided public goods and the conversion of any large privately owned monopolies into consumer cooperatives. University Co-operative Bookshop Ltd, Australia's largest consumer cooperative, established by students in 1958, has grown to become the largest provider of educational, professional and lifelong learning resources in Australia. With over 40 branches across Australia, a comprehensive website and presence on the internet since even before the web, numerous additional services and over 1.3 million lifetime members, the Co-op is more than just a bookshop. The Wine Society (Australian Wine Consumers’ Co-operative Society Limited), established in 1946, now has over 58,000 members. Also sources and sells premium wines under the Society label, runs comprehensive wine education courses and recognises excellence from young winemakers. In the United Kingdom, the nationwide Co-operative Group, formerly the Co-operative Wholesale Society (or "CWS"), owns many of its own supermarkets, as well as supplying goods wholesale to the majority of British cooperative societies, providing a common branding and logo. In Ireland the Dublin Food Coop has been in operation since 1983. In Scandinavia, the national cooperations of Norway, Sweden and Denmark joined as Coop Norden in January 2002, but separated again in 2008. In Italy the Coop Italia chain formed by many sub-cooperatives controlled 17.7% of the grocery market in 2005. In Finland the S Group is owned by 22 regional cooperatives and 19 local cooperative stores, which in turn are owned by their customers. In 2005 the S Group overtook its nearest rival Kesko Oyj with a 36% share of retail grocery sales compared to Kesko’s 28%. In France Coop Atlantique own 7 hypermarkets 39 supermarkets and about 200 conveniences store. Japan has a very large and well-developed consumer cooperative movement with over 14 million members; retail co-ops alone had a combined turnover of 2.519 trillion Yen (21.184 billion U.S. Dollars [market exchange rates as of 11/15/2005]) in 2003/4. In Japan, Co-op Kobe (コープこうべ) in the Hyōgo Prefecture is the largest retail cooperative in Japan and, with over 1.2 million members, is one of the largest cooperatives in the world. In addition to retail co-ops there are medical, housing and insurance co-ops alongside institutional (workplace based) co-ops, co-ops for school teachers and university based co-ops. Approximately 1 in 5 of all Japanese households belongs to a local retail co-op and 90% of all co-op members are women. (Takamura, 1995). Nearly 6 million households belong to one of the 1,788,000 Han groups (Japanese Consumers' Co-operative Union., 2003). These consist of a group of five to ten members in a neighbourhood who place a combined weekly order which is then delivered by truck the following week. A particular strength of Japanese consumer co-ops in recent years has been the growth of community supported agriculture where fresh produce is sent direct to consumers from producers without going through the market. Some of co-op organisations, for examples, in Tokyo metropolis and Kanagawa prefecture, manages its local politic parties from 1970's; generally names itself as the "Network Movement" ("Tokyo Seikatsusha (it means "Living Persons") Network", "Kanagawa Network Movement", and so on.). They depend on consumers movement, feminism, regionalism, and prefer to anti-nuclear. These parties keep small but steady sections in prefecture and municipal assemblies. In the United States, the PCC (Puget Consumers Cooperative) Natural Markets in Seattle is the largest consumer-owned food cooperative. The National Cooperative Grocers Association maintains a food cooperative directory. Seattle-based R.E.I., which specializes in outdoor sporting equipment, is the largest  consumer cooperative in the United States. Similarly, outdoor retailer Mountain Equipment Co-op (MEC) in Canada, is one of the country's major consumer cooperatives. In the Canadian Prairie provinces, gas stations, lumberyards, and grocery stores can be under the Co-op brand. All credit unions in the United States and Canada are financial cooperatives. In Puerto Rico, several Supermercados Fam Coop operate. ↑ Euro Coop. "Consumer Co-operatives: Democracy - Development - Employment" (PDF). p. 4. Retrieved 2011-06-07. ↑ Warbasse, James Peter (1950). Co-operative Peace. ↑ Sullivan, arthur; Steven M. Sheffrin (2003). Economics: Principles in action. Upper Saddle River, New Jersey 07458: Pearson Prentice Hall. p. 203. ISBN 0-13-063085-3. ↑ Fairbairn, Brett. "The Meaning of Rochdale" (PDF). ↑ "The Farmer Takes a Town". Time. December 25, 1944. ↑ "Attacks Splutter" (DjVu). CO-OP Magazine. January 1946: 17. ↑ James Peter Warbasse (1942). "Problems of Cooperation". Archived from the original (DjVu) on 2008-05-20. Retrieved 2007-11-22. ↑ David Thompson (July–August 1994). 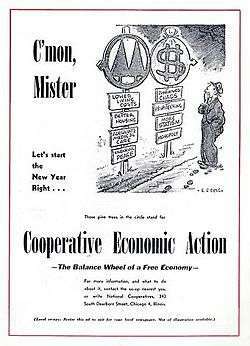 "Co-op Principles: Then and Now". Cooperative Grocer. ↑ "What Consumers' Cooperation does". Cooperation. May 1934. Archived from the original on 2008-05-20. ↑ Retailing in Finland. London, UK: Euromonitor International. October 2006. Retrieved 2007-06-28. The ICA Group, technical advice for cooperative start-ups in the USA. English website from the Japanese Consumer Co-operative Union.